Secretary of State John Kerry has called for an end to all violence in Egypt and urged moves to full democracy on his first visit to the country since President Mohamed Morsi was ousted. “History has demonstrated that democracies are more stable, viable and prosperous than any alternative,” John Kerry told a news conference. 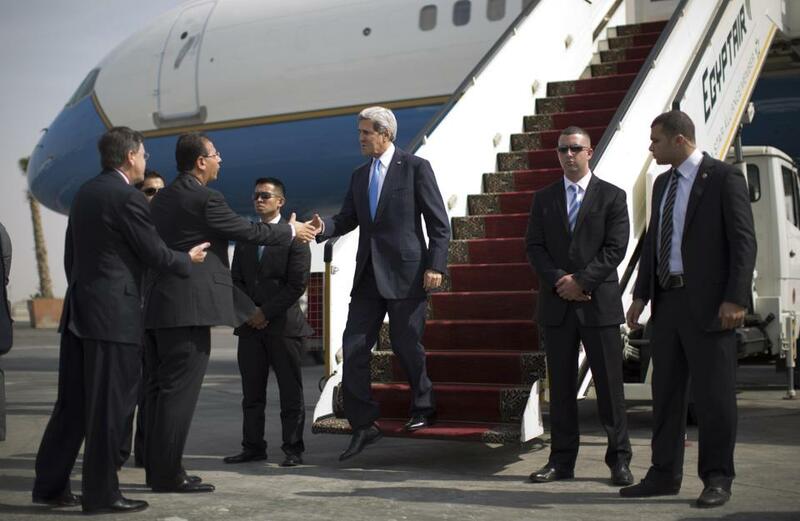 John Kerry said the US was committed to working with Egypt’s military-backed rulers. His visit to Cairo was not disclosed by US officials until he landed. It is the first time a US secretary of state has travelled to Egypt on a visit that is unannounced for security reasons. On his six-hour stop John Kerry was meeting the interim leaders that assumed control following Mohamed Morsi’s removal in July – President Adly Mahmud Mansour, PM Hazem el-Beblawi, Foreign Minister Nabil Fahmy and army chief Gen Abdel Fattah al-Sisi. Egypt is the first stage of a nine-day tour that John Kerry will take in Middle Eastern and North African countries, as well as Poland. Former President Mohamed Morsi goes on trial on Monday.